Kelsey is mobilization team leader at TEAM. 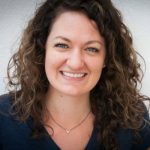 Before coming to TEAM’s staff as a missions coach in 2011, Kelsey attended Moody Bible Institute and served as a short-term missionary with TEAM in Zimbabwe. One of her favorite parts of her work is meeting with individuals to hear how God has gifted them in unique ways to serve the kingdom. As a missions coach, I regularly meet high school students who are exploring what role missions could play in their lives after graduation. For many, the likelihood of serving overseas long-term is years away. But that doesn’t mean preparing for ministry has to wait. 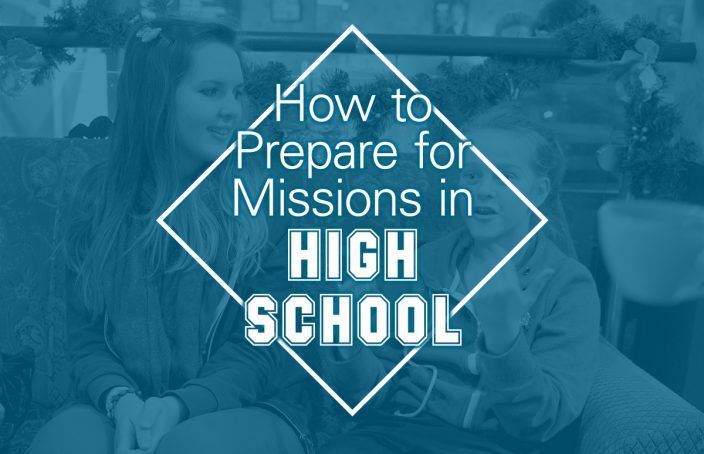 Here are four things high school students can do right now to get ready for a future in missions. 1. Form a close-knit Christian community. In his book, Life Together, Dietrich Bonhoeffer reminds believers that community with Christ, each other and the world around us is vital to making decisions and pursuing goals. Living life in deep community will influence your short-term decisions, like the college you choose to attend or how you participate in your neighbor’s life down the street. It will also affect your long-term vision for ministry and missions. Start now by asking for others to speak into your life as you speak into theirs. You don’t necessarily have to do this with a small group or Bible study, but you should form deep relationships with a few people who will journey with you in all seasons of your life. When it’s time to make decisions about missions, your community will be there to help you move forward by validating and encouraging your calling. They will also be your accountability when ministry is tough and the mundane rhythms of life cloud your vision. 2. Engage with your local church as they engage the world. Though you may find Christian community at your school, clubs, youth groups and more, one of your biggest influences should be your church. Engaging deeply with your church won’t just benefit you now as you disciple, serve and learn. It will also pay off as you develop your vision for cross-cultural ministry down the road. Ask your church about their cross-cultural ministries in North America and abroad. Get involved now by serving with them, and ask if you can explore more through an internship or volunteer position with your church’s missions leadership. Also, there are likely current and former missionaries and global professionals in your congregation who can share their wisdom. Ask them how they prepared to live cross-culturally and what tips they have for you as a high school student. They might also offer recommendations for books, podcasts or courses that can help you grow. For more tips on how to engage your church with your missionary journey, click here. 3. Get cross-cultural experience now. While in high school, take advantage of any opportunity you have to gain exposure to other cultures. If your church offers short-term mission trips, talk to your church leaders about whether one of them is right for you. If you’re interested in a certain ministry opportunity, like camp ministries, medical missions or teaching English, ask your church to connect you with an organization like TEAM. Studying abroad and international internships are also great opportunities to learn more about cultural differences and discover how your passions align with the needs of the world. Once you return from a cross-cultural experience, ask someone to help debrief you and assess how you will move forward. TEAM has put together this printable debriefing journal with questions to help you begin processing. TEAM missions coaches are also available to help you think about your next steps. If you want to serve cross-culturally for a longer term, you might be eager to get started right away. Maybe you can. But more often than not, there will be a period of waiting. Ask a mentor to help you navigate the waters of pursuing big dreams while remaining patient and receptive to the lessons you need to learn while you prepare. Never underestimate the value in being the follower while you prepare to be a leader. In his book, The In-Between, Jeff Goins helps students and young adults consider the “in-between lessons” we experience while we work toward milestone moments such as graduating high school, finishing college, landing an epic job and even serving overseas. As exciting as those moments are, it’s often the conversations, the lessons learned and the moments of “being” rather than “doing” that make the milestones meaningful. And in these in-between moments, don’t forget to often stop and listen. Pay attention to how God is molding you, shaping you, changing you and refining you. While you wait, He is actively preparing you for the work He has planned ahead. As you begin to consider missions, TEAM is here to help. Subscribe to our blog for regular missions resources that will keep you informed and inspired. 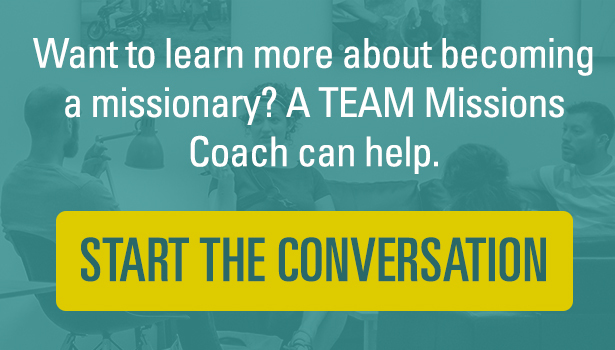 And when you’re ready, a TEAM missions coach is ready to answer your questions about becoming a missionary and help you get started. Click here to start the conversation.